Our ultra light get up meant that breakfast involved a cycle ride to Ingleton. So we packed our kit, headed to Inglesport and enjoyed a massive meal. During said meal, it became apparent that we did not have a hammer, making bolt climbing in Yordas rather impossible. No problem. Call Sir Dave and await for rescue. A cup of tea later and there he appeared with a claw hammer! 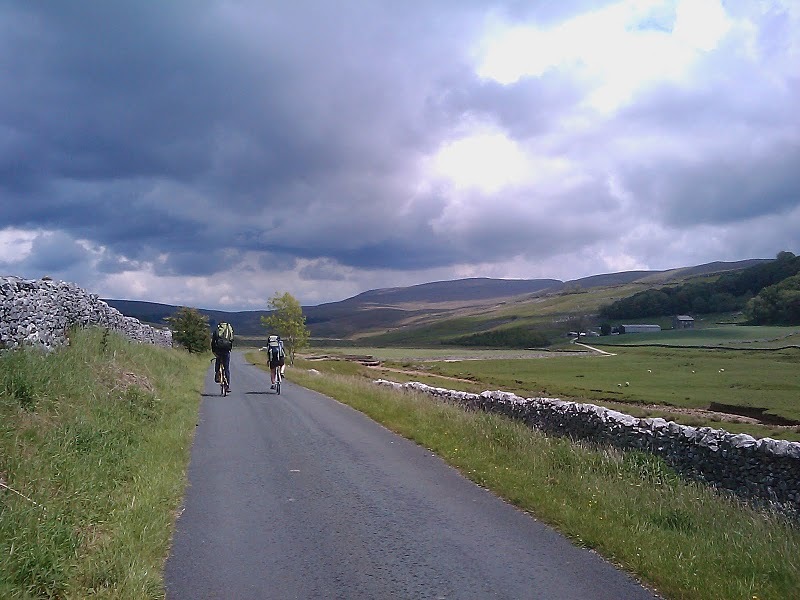 We headed up to Kingsdale on our bikes (what a lovely ride!) and parked in Yordas. Unfortunately the drill was not co-operating and showed no sings of life. Bogus! We therefore split in two teams: Clare and I went to Brown Hill while Jan went to Dent on his bike and had a massive lunch. The reason to pick Brown Hill was because the cave is currently being dived & so rigged (on 8mm) and does not require materials. I had not been caving for a while and must admit that BH is a bit of a rough reminder. After squeezing down a metal drum comes a narrow rift. The rift gets narrower until it develops into a rather nasty dog-leg. The first corner is on a pretty tight angle, but is rather spacious. The second part of the dog-leg is not as tight angled but is narrower. I was first down the passage and found myself if not panicking then at least a little worried. I knew I had done this before, but found it hard to commit to passing the corner bent backwards. After some umming and arring I went for it and passed the difficulty: a great relief! Soon we reached the two first pitches and got to what I consider the more fun bits of the cave: crawl traversing in a rift, not too exposed, never too hard, but always engaging. The last pitch is an absolute beauty and the formations in the walking passage below it a well earned treat. We dumped our SRT kit, went for a walk to the top of the last pitch and made our way out. Clare helped me carrying my harness on the exit and we were much quicker. Surfaced three and a quarter hours after getting in and enjoyed the beautiful views of a sunny day on kingsdale: how often does that happen I wonder? At the Marton arms we stopped for a lemonade and once again Dewi and Dave drove by (they had been to Bull Pot). Once again they carried our sacks back to NPC, leaving us for a light ride home. Shortly after they left Jan passed by. At the NPC, an evening of curry and wine, a visit to the New Inn in Clapham (with live music) and an evening of caving games with Nottingham and Reading. Thoroughly enjoyabe! I woke up and rode to Ingleton to buy some more grub for breakfast. When I got back we had commited to visiting Newby Moss - the closest cave to the NPC on Not For the Faint Hearted. I must admit I originally was not enthusiastic about another tight cave, but decided to go with the flow. The ride up to Newby Coote was quite steep: nice road! A long walk up the valley and a bit of looking around shake holes lead us to finding the right entrance (told you Jan!). Here I realised I left my dry socks at the NPC. Bogus! NM starts off with a loose slope and two constrictions. It is not exactly a sociable cave as there are not many places were three people can fit simultaneously! Clare was first with the tackle and dropped the first pitch. This has a rather tight head, but is only 8 m or so. The next section of the cave is good fun, with small climbs and short sections of rift. Soon a flat out section on cobbles and water is encountered. The obvious way on become impassable and it is necessary to take a narrow by-pass tube on the right. Not much praise for this passage: it is muddy and kind of smelly. The exact nature of the mud is a bit suspicious in my opinion, but I'd rather not think about it. I almost lost my wellies here on the way out btw... After this the passage opens up significantly. One more climb and you reach the next pitch, which we rigged from a hanger and an ancient steel bolt. The pitch is a cascade broken by a large platform half way down. In order to reduce rope damage we rebelayed off a flake. Acceptable rigging, but probably not up there with the 100 most bomber bits of rope work ever in the history of caving. I wonder whether another way down is possible from higher up? At the bottom of this pitch the cave comes into its own. It stops smelling funny and being muddy and you stop touching all walls at once all the time. There are lots of decoration and it's all pretty jolly. As we are rigging the final pitch it is three o'clock: time to turn around to leave enough time for me and Jan to catch the train. The way out is uneventful. We are greeted by drizzle on the surface and cycle back to Green Close in our caving gear. Luckily it's all down hill. All in all in a great trip - not sure I would go so far as describing it 'leisurely' as NFTFH does. But definitely worth it.